Jay, this 120cm x 40cm (~216 Watt) T5 light fixture would fit a 4x1,5 area absolutely perfectly! and from what i understand it comes already equipped with four 54 Watt T5HO(High Output) 6400K tubes (cooler white light good for non flowering plants and seedlings), if you would decide you want to grow flowering material then you can just swap some or all tubes for 2700K versions (warmer white light for flowering plants), 54 Watt T5HO tubes can be found all over the place so no fuss in getting new tubes when one breaks, if you want a spectrum change or for the annual switch to fresh tubes, and like i mentioned before, they are dirt cheap. Its a good solid quality T5 unit with nice reflectors and proven type of light source for a good price, you would get very even light spread of the entire area since the unit is virtually the exact same size, and you can expect good performance and growth under it. So IMHO this is the best light you will find for a fair price that will also fit and preform well in your size area. And coupled with these light hanger and you can very easily raise and lower the light as needed. IMO i see no reason to even look at LEDs if you are not willing to "pay for what you get" you also need to do MUCH homework before being able to even tell all the units on the market apart, its a true jungle in the LED marketplace, or the entire grow light market for that matter, very easy to get ripped of big time i am afraid.. so its a pure waste of money buying low quality, low output, no name Chinese Ebay/Amazon lights, rather buy something that may be of older tech but actually works better than those "crap lights" instead, like the T5 unit i linked to for example, and then save money for buying more efficient lights like quality LEDs in the future. Hope all this helps some. 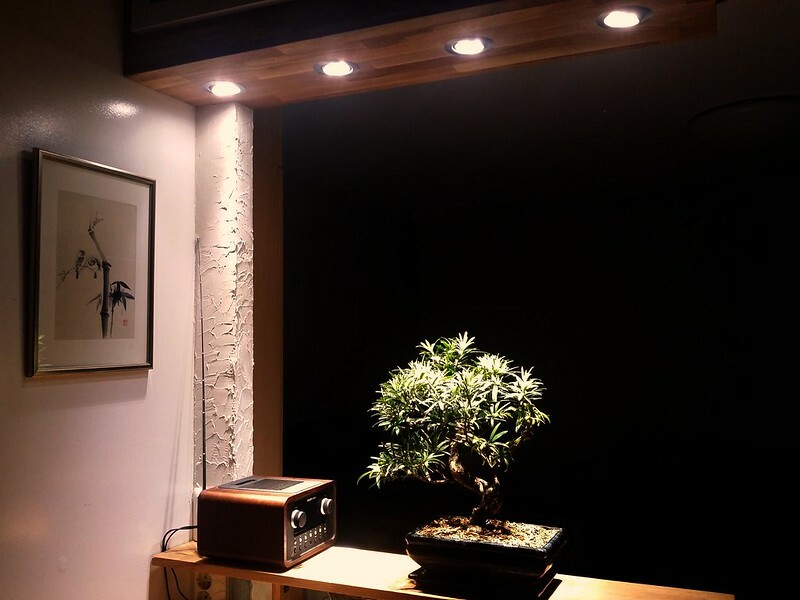 Just saw that Kaizenbonsai even sells the exact brand T5 fixtures but the shorter versions. What I am now getting is much more compact growth and backbudding. Will give you an update after half a year or year. Some specs. These are Brillight 4W LED spots with Phillips Luxeon leds. Angle is very narrow, and because of that, light levels are high. In hotspots light level is the same as in sunshine (100000 lux). I have tested 36 degrees too, and those seem to work also, if the lights are close enough. These are cool white, 5700K. There is very little light outside of the trees canopy. This is why one does not need white walls of mylar to reflect light back to trees - light is there already. This gives us the opportunity to use nice black or other neutral background. WAF is high - My wife said these pictures are lovely! I want to say, this is not about LEDs. LEDs are just one way of producing light. This is about spot lights, as compared to flood lights. LED spots would be impractical for bigger trees, because one would need literally dozens of them. I have ordered different kind of spots, 10*5W Cree spots with 35degree angle, and 6*4w recessed Sharp lamps with 25degree beam. Will be nice to see how those work. I used cool white lights here. According to THIS site, traditional grow light red-blue spectrum is not ideal to plants. Is is good only for very low light levels. If light levels are high, all visible spectrum works for plants. This is good news, we need not to suffer these horrible red-blue lights. Red and blue leds are a little more efficient, but you can ignore that, if you just have enough of light. I have now decided I will give my plants light levels of 60-100 kiloluxes. It really does not matter, how you do it. Cool white should produce little more compact growth than warm white. I copied first post of that other thread here and Fiona locked it. It was there because I knew there was a lecture coming . Those two are from the same plant, root stock of those horrendous "Ginseng Ficus". Plant on the right is a cutting. I am sure you notice the difference . Thing is, plant on the left has been under spot lights for 18 months, first under metal halides, then under leds. Cutting has been under fluorescents. It grows very well, as you can see, but growth habit is useless for bonsai. Huge internodes, large leaves. 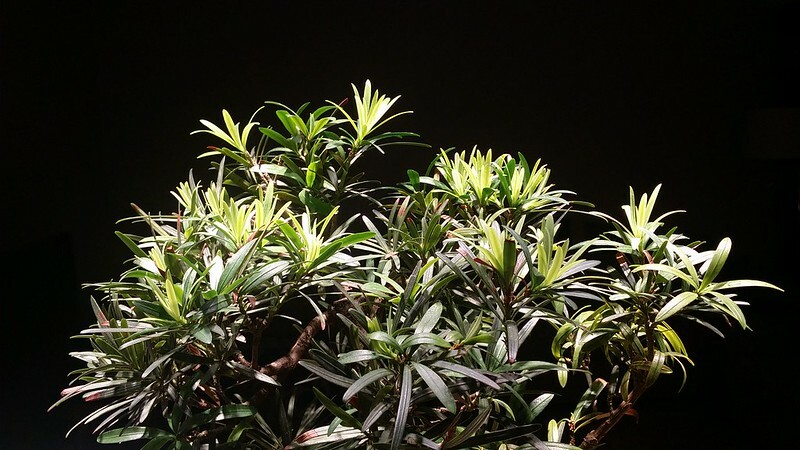 All generally available plant lights are flood lights. If you only want to keep trees healthy over a few winter months, they are OK. BUT if you want to keep tropical trees indoors whole year round, like I do, then it's a different story. THIS SITE has a marvellous light calculator. Its in German, sorry, and uses Flash. I can use it and I don't speak German. Calculator says it's 484 lux. Next, same light output, same distance, but 35 degrees spot light. Calculator says it's 6877 lux. It is 14 times more. Honestly, this thing is more important than do you use LEDs, MH, fuorescents, HPS or LSD. Those values are very small, but the same ratio holds true for larger lamps too and any distances. I challenge you to go there and check for yourself. For small wattage led spots I use 10cm distance. Again I would like to compare our lights with sun. Full sun is about 100Klux. In my limited experience, Ficus do very well at 80Klux. Carmona wants to have full sun, as do Ligustrum sinensis. Those like to have that 100Klux. When we watch our lights indoors, they seem very bright. Actually light levels are like in deep shade outside (unless you really have a lot of it , like thousands of watts). Using flood light is like keeping your outside trees under the benches, not on them at full sun. I have measured lux values right from the surface of a fluorescent tube. They are in the area of 30-50 Klux. 5cm away they are a lot less. Where the plants are, intensities are about 10-20 Klux at the most. There is no way one can get decent light intencities with fluorescents. It does'n mean plants don't grow, they are very adaptable, and they do grow, if all other things are in order. Actually, they may even grow very well. They think they are in shade, and they desperately reach for the sun. As you see, this is open system, and it really surprises me podocarpus do so well. Late winter is generally difficult time for trees in open systems, because of dry air. 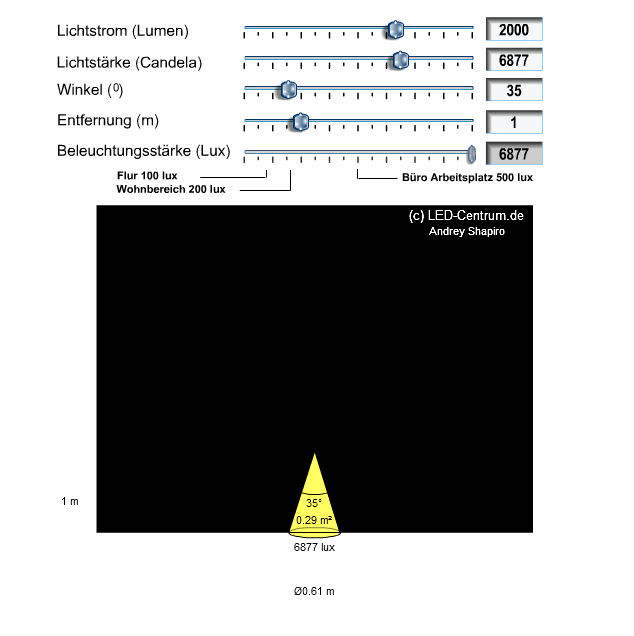 Light intensity is also not too great, 17 Klux, but it seems to be enough. 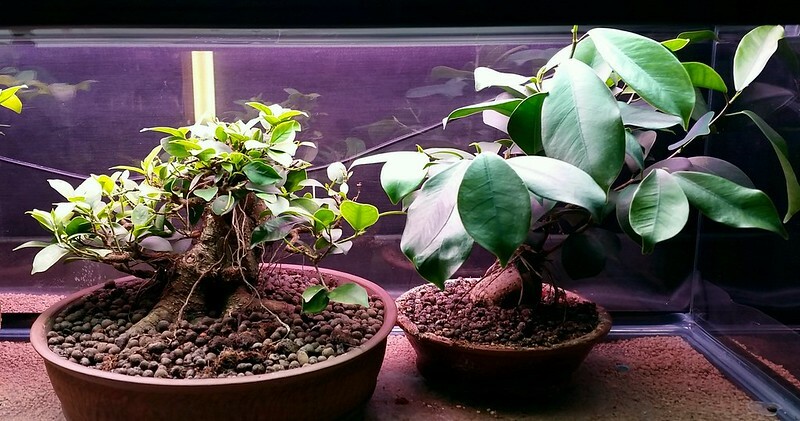 Here's a LINK to his indoor bonsai light related pictures! JWT wrote: I copied first post of that other thread here and Fiona locked it. It was there because I knew there was a lecture coming . I do agree that much larger leaves and longer internodes is to be expected with lower light intensity's of Fluorescent lights, it is off course also in part spectrum related. But i would not go so far to ONLY blame the Fluorescent lights for the growth habits of that cutting compared to the much more established tree on the left, i know its part due to low light intensity, but i would say that the growth habit is also very typical for a cutting with few growing points, in time as it gets more branches and better ramification the leaves will decrease in size dramatically even under low intensity Fluorescent lights, off course not as much as if it had been under high light intensity's, but still.. So even if i think you did a rather unfair comparison there i still totally agree with you! Very High Light Intensity in the right spectrum range is key to getting the growth habits needed to develop quality trees indoors, couple that with the right temperatures and humidity levels and we can almost develop our trees just as good here in the cold north as they do in the tropics, now that's some cool stuff IMO. Nice light calculator! sadly i can't get it to work..
You are right, of course, Dreamcast, that comparison is not totally fair. But, the reason for left one being more established is party because of quicker development. Anyway, the leaf size, internode length, density, in other words growth habit is different. Perhaps density is the word. I was going to keep one terrarium with fluorescents, but can't really justify that to myself. There is about the same amount of power (under 200W for both terrariums these plants now live in) but plants receive like 5 times more light with led spots. Calculator does not work with Chrome any more, probably because of an old and insecure flash version. I used Edge, perhaps IE works too. There must be newer somewhere . Aha! i will then try some different web browsers, thanks! Your work with spots and the terrarium's have really inspired me to look in to more focused and targeted lightning alternatives as well as a new setup, i will hopefully have some rather different LED lights to test with the new and improved setup. I think its safe to say that very focused and targeted white LED lights coupled with a closed or near closed setup, higher temperatures and around 100% humidity is the most efficient and effective way to grow tropicals indoors in colder climates, its now IMHO just a matter of refining everything in this type of setup. No rest for the one who wants the happiest of trees and cleanest of setup! Just some thoughts on how to get spot lights. I use high quality small wattage led spots, but it is a laborious approach and hardly in everyone's interests. They are also only practical for small trees. Higher wattages are needed for bigger trees. One option would be using a lamp like Onyx veg, and either ordering it with 35 degrees (45?) lenses (instead of standard 80 degrees) or if that is not possible, find out the exact lens used and changing it yourself. They could even sell spot lenses or tell where to find them. Second option would be to use standard rail shop lights. These could be very expensive, but also they could look very nice. Some even have adjustable spot widths. Some are available rather cheap from China through Ali Baba, but risks are high. Risks are poor reflectors, low quality leds, other low quality components, inadequate cooling, build quality etc. Once one finds a good manufacturer, it should be safer. Advantage with separate spot is one can adjust them according to the need. For example, space between the trees is not illuminated. Available at least 10-300W on ebay. Many have both spot and flood, we only want spots. 30 degrees beam is available. One would need correct driver for these. Of course any led light should work, if it has spot light lenses or one can change them. Another great option could be higher watt CREE COB LEDs with optics or reflectors instead of many smaller spot lights, when driven COBs softly they have an incredible efficiency and raw power, and with a dimmer and changeable optics and reflectors the same light/lights could be used for everything from small to big trees and at almost any distance with good LUX and PAR numbers, these are the type of lights i am hoping in testing soon, have very high hopes in them! There already are many CREE COB based LED units out there with many COBs in one big very powerful unit, but one COB for each tree is way better IMO. Something like this! one of these for each tree, mounted on a long rail so they can be positioned as needed when needed. That should work too . It is still a flood light though. I have got tired of apical dominance with indoor trees, especially Ficus. If you have one light on top of the tree, top will receive most light. Development will be slow with bottom branches (if light is dim, they do not much develop at all). Top also shades rest of the tree. This is never so prominent with outside trees, because whole tree receives same light intensity. One of my biggest goals was to tame apical dominance. This I do by giving lower branches at least as much light as top gets. 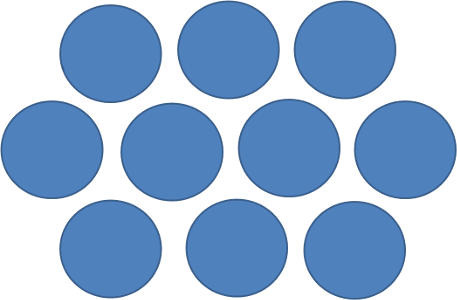 Hence this setup with many small spots. I did consider using large heatsink (like 20x20cm) and three 10W COBs glued to that, using opticts. Show stopper for me was each COB need a driver of its own. I consider my current setup simpler than what I had in mind. Other thing was I couldn't find optics that was really spot, only 60 degrees or so. It will be interesting to see what is your setup . I think your setup with the spots is the best and well planed one i seen so far, and i was about to do something rather similar but with my Apache units instead of spots, the units are ~6000K and have 28 degree lenses, so basically 2 giant spotlights! Had them mounted and hooked up and took some readings, a very very even "light coat" of +100.000LUX at a good distance from the trees over only the selected area thanks to the very tight optics, just perfect! But after considering these units are not by today's standard very efficient and draw close to 170Watt each, and the fact that i needed both to effectively cover only one of my areas at that mounting distance due to there chip layout, optics and unit size (~40x40 cm), that meant ~340Watt over a 100x40 cm surface area... not very efficient at all!... so i scraped that idea very quickly! I know the CXB COBs don't have the same tight light distribution as spots or the Apache units, but they are so very efficient especially when driven soft, so by keeping them rather close with the 90 degree reflectors and a dimmer to tune everything in then i hope to easily see those 100.000LUX at the tree tops while using the absolute minimal amount of power, and since the multiple COBs will also overlap each others light footprint i think it can be a rather even coat of light with minimal tendency of shading of even lower branches. I have actually read that Ficus is not an apical dominant type of tree, these 2 articles are very interesting and both deal with this subject. With techniques like taking advantage of aerial roots to direct growth where its needed i hope to achieve some very good results with the new setup, time will tell. JWT, you said in a previous post that you think 4000K is a tad better then 6500K, can you please tell me more in detail how much of an improvement you have seen, anything that was better with 6500K? Trying to decide on what Kelvin temp to use for the new lights. Dreamcast wrote: … after considering these units are not by today's standard very efficient and draw close to 170Watt each, and the fact that i needed both to effectively cover only one of my areas at that mounting distance due to there chip layout, optics and unit size (~40x40 cm), that meant ~340Watt over a 100x40 cm surface area... not very efficient at all!... so i scraped that idea very quickly! Interesting numbers! That is very close to what is needed if one uses metal halides. You need 1000W to illuminate 1 square meter with 100 000 lux intensity. You calculated 340W for 0.4 square meters. This is the way it is, if you illuminate the area the trees are growing. You get sun intensity to 10x10cm area with about 10W from a high quality light source. Actually, for a mame 10W is all you need, if you can direct it all it to the tree. With shohin, 30W is enough. Bigger trees need more. 30W for shohin only works with really tight spots, otherwise light will be outside the tree. Another way to put it, looking from above, how many percent of the area illuminated is populated with green leaves? I made a drawing of the bottom of one of my terrariums and estimated. Its somewhere around 30-40%. If one only puts the light where the trees are, 1/3 or ½ of the wattages is needed. I am by now very sure, that one does not have to illuminate trees evenly. Tops will grow with a less light. I suspect low branches will not. By the way, those Apache units you mention really seem like perfect to me, but I would use them both for one big tree, perhaps 60-70 cm high and wide. My spots have CXA cobs, and they really are efficient. 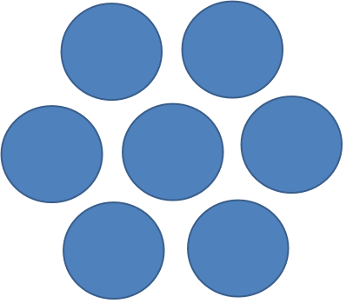 I use 7 spots at the most for one tree. (My led setups are for small trees, 25cm at the most including the pots.) Wonder if it is possible to use both reflectors and lenses? Adjusting angle would be awasome. I checked 50W, 90 degrees, 5000 lumen with the calculator, and 100 klux is 16cm from the light. How high are your trees? At 32cm light intensity will be 25 klux if there is no shade from the tree. At 48cm it will be 6 klux. Seems to me this could make your Ficus apically dominant. That sounds really good! Could you point me where you get that driver? Dreamcast wrote: JWT, you said in a previous post that you think 4000K is a tad better then 6500K, can you please tell me more in detail how much of an improvement you have seen, anything that was better with 6500K? No I have nothing to back that up. I do think it’s true though, growth seems to be better. Green color is much prettier too with 4000K, especially new leaves! With high intensity light I doubt there is a big difference. JWT wrote: By the way, those Apache units you mention really seem like perfect to me, but I would use them both for one big tree, perhaps 60-70 cm high and wide. I agree, the Apache units would really be something for example Jerry Meislik to replace his current MH fixtures with, i can't even imagine the performance of ApacheTech's newer and stronger units.. brutal lights, but not for everyone that's for sure! JWT wrote: My spots have CXA cobs, and they really are efficient. I use 7 spots at the most for one tree. (My led setups are for small trees, 25cm at the most including the pots.) Wonder if it is possible to use both reflectors and lenses? Adjusting angle would be awasome. I don't know what CXA size or bin your spots use or there efficiency, can you get a hold of that info maybe? These CXB3590 of the highest bin actually deliver +180 lumens per watt depending on Kelvin temps when driven at 1400mA (~50Watts), if driven even softer the efficiency off course goes up even more, they are very powerful and efficient! My trees are ~20-35cm high including the pots, i will start by using the 90 degree reflectors rather close, if the reflectors don't work to great then there are now many other options for COB reflectors and lenses, even spotlights ones, the light system i will be using is very open source, versatile and easy to modify, so i have very high hopes in this kit and in the many options + dimmer to get everything tuned in. JWT wrote: That sounds really good! Could you point me where you get that driver? This is the kit i will testing. I think this is the driver used for the kit, if that driver is not what you need then they are very knowledgeable over at Cutter and can most likely help you find a single driver that can run each of your terrariums. JWT wrote: No I have nothing to back that up. I do think it’s true though, growth seems to be better. Green color is much prettier too with 4000K, especially new leaves! With high intensity light I doubt there is a big difference. Thanks, you confirmed my thoughts! 6500K or even 5000K is to bluish IMO, and from memory MH lights are around 4000K? and i love the look and growth under that spectrum! So 4000K it is since i want the best trade of between grow and display light. Dreamcast wrote: I don't know what CXA size or bin your spots use or there efficiency, can you get a hold of that info maybe? I dunno , chip used is Cree XLamp CXA1304. Highest wattages is over 10W, I guess, but because cooling is not great, I run first lot with about 4.5W and second lot for little over 5W. First 40 I bought from ebay from seller adengsolo. Then he had none when I needed next 40, so I bought from seller beetrims, same pictures, supposedly same factory (brillight). They were not made by brillight. Less light. Ebays buyer protection is a good thing, I returned those, and he claimed he can make better ones, so I let him. Next ones were better, not quite as good as adengsolos, but of reasonable quality. I want 100 klux under all spots, thats all. Adengsolo told me these are so expensive now, would be USD 11.50, that he is not going to have them in stock any more. I don't need any now, so I have time to figure out what to do next, or to wait for something come up. If I could make a suggestion? Indoor lighting as a whole has a huge spectrum of technical, scientific, common and assumed knowledge all together. 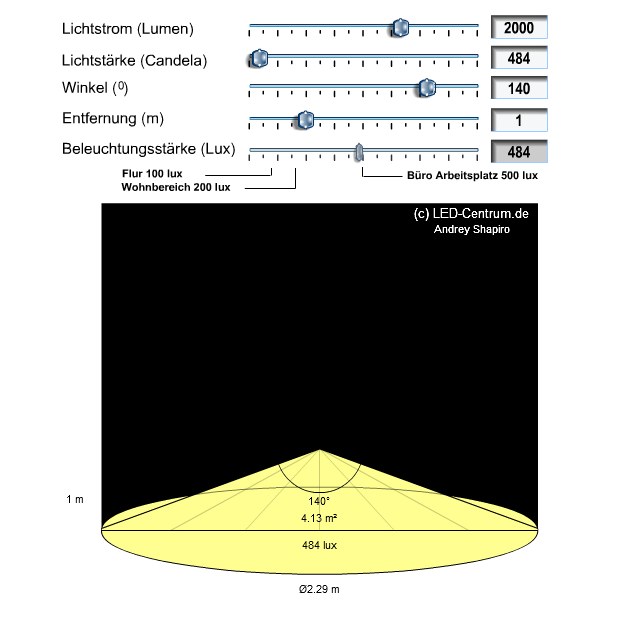 It would be great if perhaps we could compile a listed post stream on the topic starting in logical order from indoor lighting types/options available, a break down of terminology (ex- Lumens, spectrum's, blue/red/white light etc..), then a post detailing each pro's/con's of each one, a post on basic understanding of how light effects plant life. If a few members got together - I would be willing to help out as much as I can with my limited understanding, but I can provide what ive learned, mistakes made and research found, also a place to post our own record of experiences having tried LED light bulbs, LED panel lighting and CFL grow lighting to provide tested reviews on what I learned - such as heat/dry humidity from the lighting drying out plant and soil a lot quicker than natural sunlight. In short- Lighting is a topic we've talked extensively (23000 views) on the site and if we could provide a factual order covering all the basics and further scientific depth further on to that, and separate reviews, opinions and such to avoid confusion? Also it will provide all the effort JWT and Dreamcast (and many others) with research and pictured diagrams easily found to everyone interested instead of hidden in a backlog of messages. Anyone else finding it troublesome grasping artificial lighting a mass of scientific theory, terminological enigmatic fact conundrums and simply advertising propaganda? LETS SORT IT OUT for us newbies to learn whats genuine. Post One - Why is there a need for Indoor Lighting and What Types Of Artificial Lighting Are Available? If someone (not me as I know next to nothing about growing under artificial lights) cares to put this good idea together, we can lodge it as a tutorial. Up to you guys though. Isn't this already done. Wikipedia on grow lights for example. Forum is not a very good place for this kind of thing, it is great for discussion and sharing. Generally accepted compilation would be a a difficult task for several reasons. First thing that comes to my mind, there is no consensus. For example, people always seem to be happy with whatever lighting they currently have (and that includes me). Our conditions and aims are also not the same. Some only need additional lighting, some depend fully on artificial lighting. Those living in the north have very dry air for much of the year, affecting what setups work. Some are ready to spend a hundred times more than others. Some are ambitious, some just have a fun hobby. When there is no common ground, it is difficult to come up with common solutions. One way to do this is what Jerry Meislik does. He represents his solution, and proves it works for him. 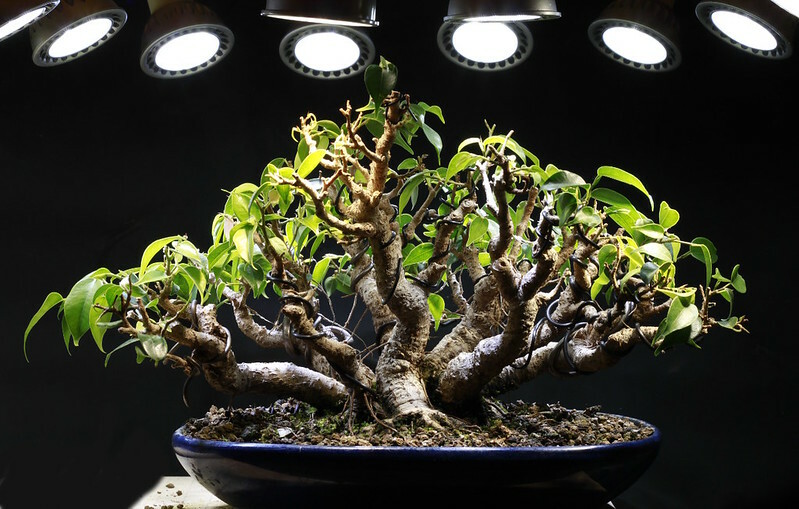 This approach is problematic because solution could be good, but hobbyist does not have proper material (trees), or lacks the artistic view or bonsai growing skills, and because of that can not prove anything . There is a very short list of working solutions . Perhaps it is possible just to represent those? I understand that this thread to some can be experienced a little "messy" and long.. maybe a separate Forum section for us indoor enthusiasts could be a good idea? This way everything related to this topic do not have to be compressed in to one long thread as it is now, everyone could present there own setup, ideas, experiences and questions in separate threads without it clogging up the main forum board. This i think is the only solution to have everything gathered while still being easy to digest and navigate through for people with all level of knowledge and interest in this part of bonsai cultivation. 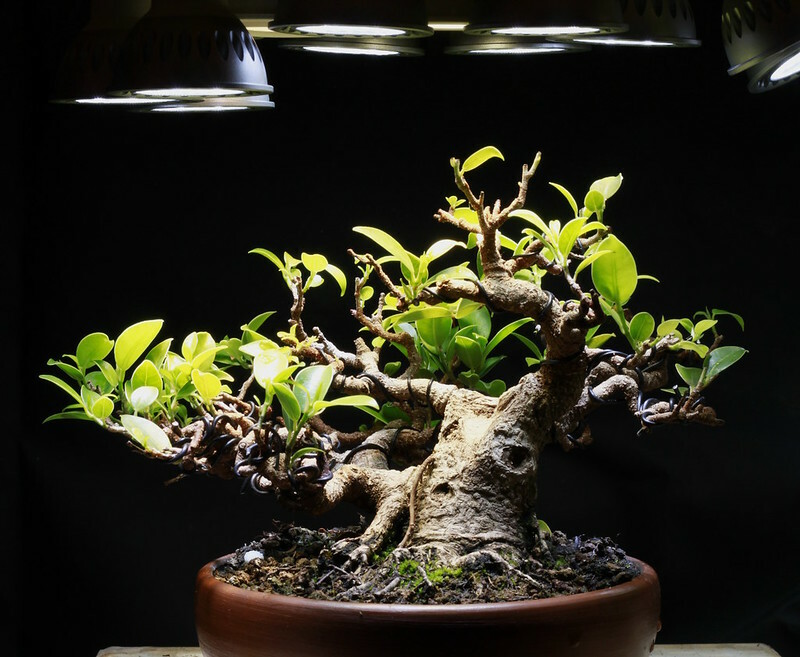 Off course this thread can still be alive as a generally ideas and discussion thread about Artificial lightning for bonsai, might be good as it still contains some great info for those brave enough to read it all.. ! Is there anyone who has tried adding c02 in their grow tent to accelerate the growth of their bonsai ??? That's a good question, not sure if it would make much difference in a area with ventilation, but in a closed system like i my self is running then it could very well make a difference, even a big one! i may have to test this in my new setup that i hope to have ready soon, since its a very sturdy larger display terrarium i actually think i can fit a c02 tank under it, will look in to it and update on that subject, GREAT IDEA! I have a small bottle of water, yeast and sugar in one one of my terrariums. Don't know is it any good. If the setup is very closed, I think it probably is useful. If there is even little ventilation, I doubt is it of much use.